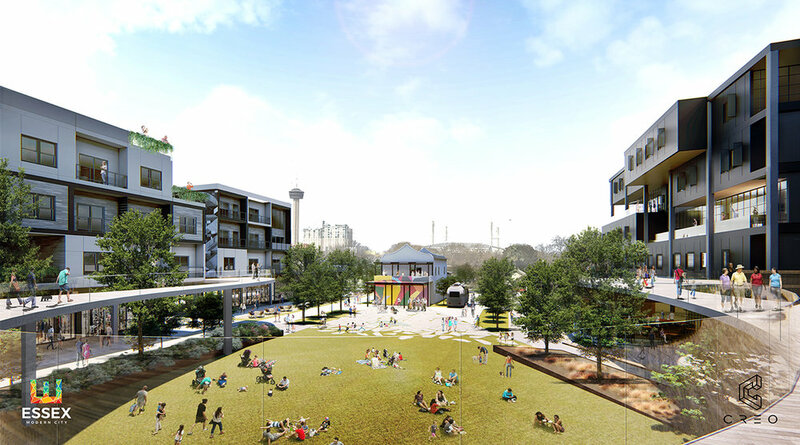 Essex Modern City strives to set a new standard for mixed-use development in San Antonio, reinventing urban infill development, by referencing the historical patterns of San Antonio as a Spanish colonial city based on while embracing new technology’s impact on the urban environment. It returns the focus to the people, both those who live there and visit, by making it a walkable community with vehicular access limited to emergency and service access. The large central plaza and extensive green space throughout provides a venue for events and exhibits for residents and visitors. Vertical and horizontal urban farms will grow produce to be utilized by restaurants on the property, purchased by residents/visitors, or marketed as a revenue source to those managing it. A market will provide a venue for local food vendors and craftsmen to market and sell their goods. Local arts and entertainment will be celebrated throughout the Essex Modern City development.